Universal Expansion Joints - American BOA Inc.
Universal expansion joints contain two bellows elements with multiple convolutions joined by a common center pipe or spool piece. These joints are used for the purpose of absorbing any combination of the three basic movements of a piping system, i.e. axial, lateral, or angular movements. 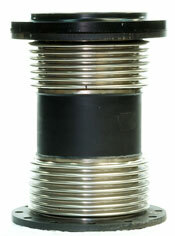 Universal expansion joints are used to accommodate lateral movements that are too excessive for a single axial expansion joint, or where there is a limitation on the amount of lateral forces allowed on the connecting piping system or equipment.